Exotic Hadrons: There Is The Rub! Last Friday I was in Pisa, at the Scuola Normale Superiore (see picture), where italian members of the CMS Collaboration gathered for two days to discuss the status of their studies, exchange ideas, and try to coalesce common analysis efforts. Besides the many talks discussing physics studies with CMS, which I am prevented to discuss here, there was one which I really enjoyed listening. It was an invited seminar by Antonello Polosa, a theorist who has been working on the fascinating topic of exotic hadrons. I have taken some notes while listening to his talk, and I am now sharing them with you below. Beware, my stenographic capabilities are limited, so I have certainly missed some important statements, which might make the text hard to understand. I did insert some explanations to the text, but kept my intromission at a minimum. So read at your own risk! 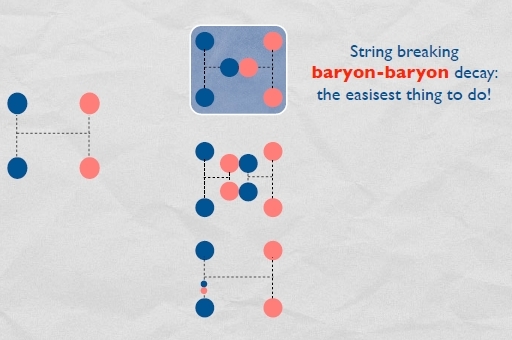 Exotic hadrons do not have a structure of the kind we are accustomed to, q-qbar pairs (called mesons such as the pion or the kaon) or three-quark combinations (which are called baryons, the simplest examples being the proton and the neutron). We are talking of molecules of mesons -that is, loosely bound states of those particles-, or tetraquarks (easy to guess, bound states of four quarks), or pentaquarks (five quarks bound together), etcetera. There are hundreds of papers written on the topic, by quite knowledgeable theorists. Among them Tornqvist, Braaten, Close, Voloshin, Mehen, etcetera. There are two possibilities considered recently of hadrons composed of hadrons: there are many data coming from B factories, and impressive measurements done by CDF. CMS and LHCb will be able to do analogous studies. And theoretically, it is interesting to study such particles, since any conclusive observation would be by definition exotic physics. Maybe not as exotic as supersymmetric neutralinos, but nonetheless stuff that lies beyond the zoo of particles that we are accustomed to deal with. The X(3872), the first of a series of amazing particles, is a 1++ resonance state of charmonium. It often decays into the J/Psi pi+pi- final state, and one saw very soon that it cannot be considered an excitation of charmonium. A wealth of new resonances discovered since 2004, which decay into charmonium, has been found: 14 states at least. They do not overlap to discrete charmonium levels, and they do not behave as charmonium states. The X could de-excite by emitting a photon if it was some charmonium state, but the X(3872) has a photon plus J/Psi decay rate which is much less frequent than what would have been expected for a charmonium excitation: 1/40th of the rate of decay to the J/Psi pi+ pi- final state, or less. 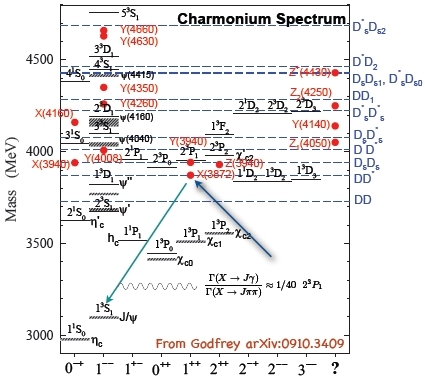 The figure above shows, as a function of the different spin-parity of the resonant state, the mass at which charmonium and candidate new charmonium states (the red dots) have been observed in the last 6 years. The black horizontal segments show the original, well-understood charmonium levels; the blue dashed lines show the thresholds above which open decays to charmed D hadrons are enabled by energy conservation (save the binding energy of the state). The red dots do not fit in the good-old spectroscopy-inspired pattern! Also note: in the figure the expected radiative decay of the X(3872) is shown by a cyan line. This does not really seem to fit the hypothesis. The X(3872) is also very narrow: its width is less than 2.3 MeV. It may decay in a way that by strong decay it violates isospin. The other peculiarity is that the X mass is equal, within the by now very small uncertainties, to the sum of a D and D* meson. The strong violation of isospin, clarified by the decays to J/Psi rho and J/Psi omega final states with almost the same rate, rules out the possibility that it is a hybrid meson. X is produced readily in hadronic collisions, which one would not expect for a weakly-bound molecular state. A molecule would accommodate isospin violations, because one could have both I=0 and I=1 combinations. The radius r0 turns out to be of the order of 8 fermi. This is again strange because the two D mesons are far from each other; so the two charm quarks are also far away, and yet they must be talking with each other using strong interactions at a radius 10 times larger than that typical of QCD if they are to create a J/Psi. So such a molecule has a hard time to fluctuate into a configuration that allows the decay to a J/psi. One also saw the D D pion final state of X decay. The D* has a width of about 70 keV, while the width of the X into D D pion is 10 MeV. So the D* has to be accelerated in its decay speed, which is the opposite of what one would naively think for bound states. A possible way out of all the above problems is to think that the X in reality is not composed by a DD* pair, but it is instead a new kind of hadron, one which is composed not of charm-anticharm, but four quarks: a diquark and an anti-diquark. The diquark qq has the same colour configuration of the antiquark (it is easy to realize it with SU(3), but also just thinking of the fact that qq binds with a third q into a baryon, much like does a qbar to form a meson), and this strong attraction would allow the binding to form. So a diquark plus anti-diquark is a 3-3bar system, quite similar to the q-qbar as far as strong interactions are concerned. This way one can explain the observed decays to J/psi rho and J/psi omega, as well as isospin violations, but such interpretation opens a wealth of other interpretations for other states, in turn. One may construct a lot of diquark spectra. The most eclatant prediction one gets by walking this walk is that there exist charged particles of the same kind. The X and the similar others found this far are all neutral, but charged states must also exist if these states are four-quark systems. One may even construct a c u dbar sbar tetraquark state at charge +2. None exist instead with lighter quark combinations (Antonello said he would not explain why unless asked at the end of his talk, and then I forgot to ask, nor anybody else did! Does any well-learned reader here know the answer to this ?). The question then is, where are these additional states ? Their existence is the strongest prediction of this model. BELLE discovered several states, and they indeed say that there are a few. The Z+(4433) decays into psi' pion, and this has been seen as a 6.5-sigma effect. BELLE also discovered the Z1 and Z2, both charged, both going into pion and some charmonia states with angular orbital momenta. LHC might look for such states. The Z+(4430) could be searched by the CMS and ATLAS experiments. If this Z+ is found again, it would be the footprint that four-quark states exist. The Z+ is difficult to explain as a molecule; besides, if we do not find charged states, this is a problem for the four-quark hypothesis. One could even study the D+K+ molecule, at about 2500 MeV. Is there any resonance there ? Antonello then moved on to discuss the molecular hypothesis. This interpretation is favored in the US. CDF saw the X(3872), and its prompt production in Tevatron proton-antiproton collisions is of about 30 to 70 nanobarns. This means that it is promptly produced, and is not the result of chain decays from B hadrons. How can a loosely bound state (one with an almost zero binding energy, since the X has exactly the mass of the two D mesons) be produced in the wild environment of hadronic collisions ? He took standard Monte Carlo generators, Herwig and Pythia, tuning them on CDF data for the production of D and D* mesons, making sure that the azimuthal angle distribution d(sigma)/d(phi)of the DD system was well reproduced, and with this calibrated Monte Carlo he looked at the production cross-section of pairs with small relative impulse, since a molecule must have a small relative impulse to form. He estimated that the relative impulse must be of the order of ten MeV, at maximum 40 MeV. Both Herwig and Pythia after tuning say that prompt production in this range of relative impulse varies from 0.07 to 0.11 nanobarns, which is 300 times smaller than experimental measurements. What may LHC do ? The ATLAS and CMS experiments can certainly measure the production cross-section of the X. Antonello and collaborators do not believe that a molecular interpretation is viable with the large cross section seen by CDF. Also Eric Braaten (another expert of heavy quark mesons) studied the problem, and too found that the prompt production is too large. With first LHC data one may also try to understand if fragmentation functions for tetraquarks may be written. There are other hypotheses one should consider to explain the existence and characteristics of these new states. The charmed baryonium is one of them. The Y(4350), (4630), and 4660) states have some interesting features: for the 4630, given the large rate of its decay to , the ratio with the decay to psi(2S) pi pi is 117+-44. This has the same characteristics of the X: looks like charmonium but is not it. However, this assumes that the 4630 and the 4660 are one and the same particle. The fact is that BELLE published them in two different papers, and if one takes the data at face hand, a single resonance appears a better fit than the double resonance hypothesis! The model we are thinking at for the state which decays to a baryon-antibaryon pair is a QCD string like Samson's hair: the string of color is best broken by forming baryons, because the breaking of a string yields a quark-antiquark pair, which allows the creation of a three-quark system on a side, and a three-antiquark system on the other. Such a baryon-antibaryon decay is almost always prohibited by the energy budget of the reaction (the two final state bodies having more mass than the originator), but in the case of the Y it is possible. And thus it happens quite readily. CDF is searching for the charged Z states. The Z(4430) is very interesting. The 7-sigmas of BELLE would need a confirmation. If we saw a doubly-charged state with mass equal to the sum of the constituents, it would mean that strong and electromagnetic forces are competitive at the scale of length of about 10 fermi. So it is impossible to form a doubly-charged molecular system, because they would have to be produced and get close to form a weakly bound system. Such a discovery would be another footprint of the multi-quark state hypothesis.